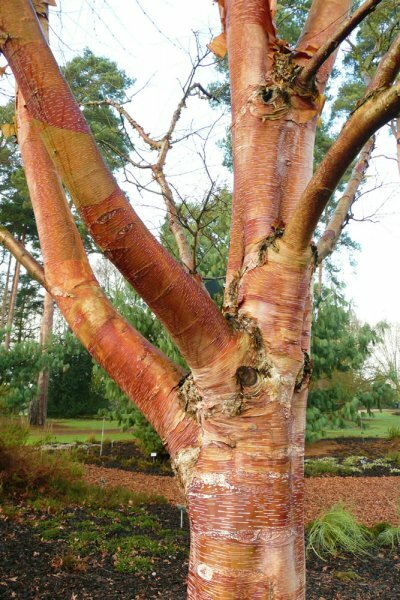 Betula albo-sinensis 'Red Panda', Betula bhojpattra var. 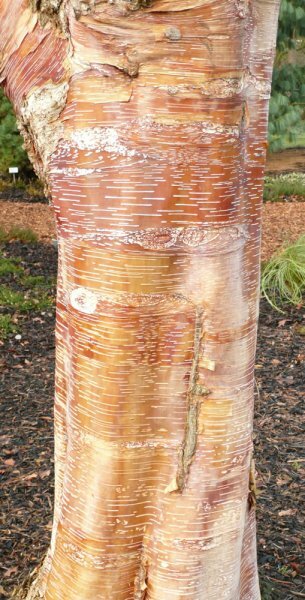 sinensis 'Red Panda' Betula utilis var. sinensis 'Red Panda' and Betula utilis ssp. albosinensis 'Red Panda'. Grows to 15m tall by 10m spread. Birches are happy to grow in most soil types and pH. They will tolerate any aspect, exposed sites and occasional drought or waterlogging. A sunny spot will accentuate the bark colour. This is a relatively small tree (growing to 15m tall) with a bushy habit. It bears dark green, ovate and slightly serrated leaves from spring, which yellow in the autumn. 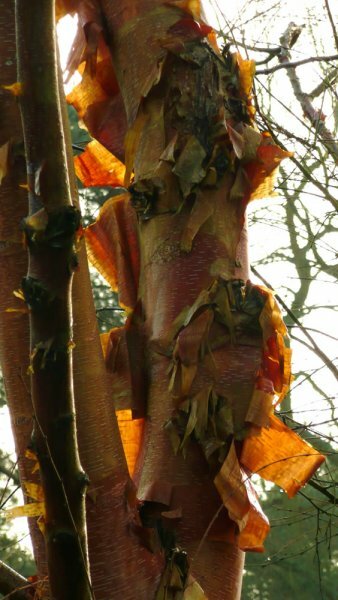 Its attractively peeling bark is orange-red in colour although the freshly revealed bark is much lighter in colour. The stems have white, horizontal lenticels. Birches are monoecious, both the male and female flowers occuring in catkins. The resulting seeds are also contained in catkins. 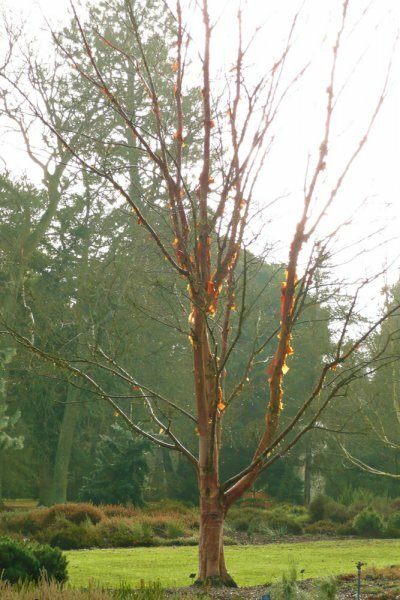 Great as a focal point in a large lawn (ideally with the sun behind it so you can see the peeling bark glowing in the winter), or planted in groups to make the most of the winter display. It’s suitable for most styles or garden, though the bushy habit may be considered a little untidy for very formal designs. Its size would make it perfect for all but the smallest gardens. Many birch cultivars are grafted and the roostock (often Betula pendula) usually has a fairly shallow root system. This means that some plants may struggle to grow underneath them due to the competition for water and nutrients. However, spring bulbs will usually grow quite happily and colours can be chosen to compliment the winter bark display. Grafting is the most common way of propagating birch cultivars. Generally Betula pendula is used as the rootstock, but Betiula nigra can also be used. Grafting should be done with a whip graft or spliced side graft. Make sure that the compost is kep fairly dry until the scion’s buds break otherwise there’s a risk of too much sap bleeding at the graft point. Pot it on and water as normal once the graft takes. The birch tree has been a great resource for centuries, particularly so because of its quick growth rate. Birch wood is used to make a wide range of products including furniture, charcoal, paper and for fish smoking. Its bark is used as paper and in the tanning industry to fragrance leather. The flexible twigs are traditional used for making brooms and ‘the birch’ – a type of whip which was once used for punishments in schools and prisons. This cultivar was named ‘Red Panda’ by Jim Gardiner of RHS Garden Wisley in reference to the red panda bears which live in the area of China where the plant originates.